Calling rajas a versatile dish might be an understatement; these strips of chilies and onion in cream become a main dish as a filling for tacos, make a flavorful side dish for grilled meats, work as a mix-in ingredient for scrambled eggs and the like, and, when used sparingly, serve as a condiment. Relatively mild poblano chilies make the perfect choice for a dish like this, in which the flavor of the peppers becomes more important than their spiciness. 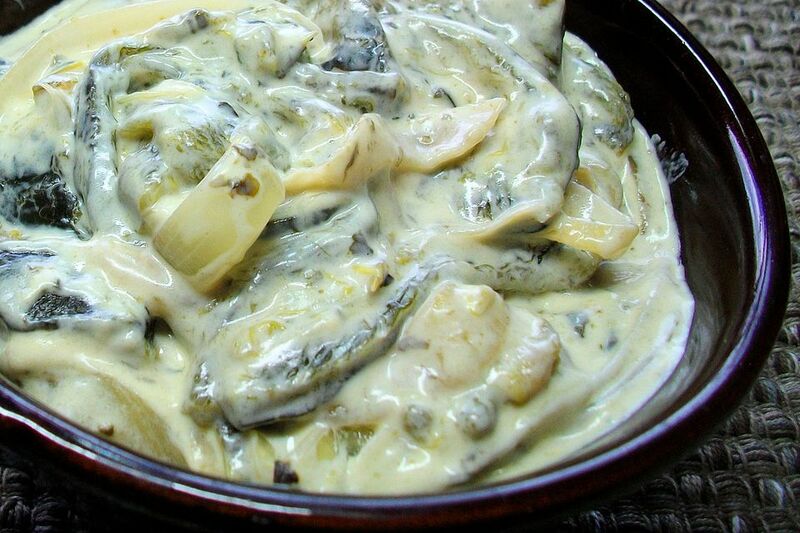 Make a double batch because you will find many ways to enjoy rajas once you have them on hand. Roast the peppers, either under a broiler on high or over an open flame, until the skin blisters on all sides, about 10 to 15 minutes. Let them “sweat” in a plastic bag for another 15 minutes. Then peel them, remove the seeds and stems, and cut the flesh into 1/2-inch strips. Heat a large, heavy pan (cast iron, preferably) over medium-high heat and drizzle in the oil. When the oil begins to shimmer, add the onions. Cook, stirring occasionally​ until the onions turn translucent and begin to brown on the edges, or for approximately 10 minutes. Reduce the heat to low. Add the peppers to the onions. Stir in the cream, salt, and pepper and cook everything over low heat for 3 to 5 minutes or until the cream heats through. Wrap a spoonful of rajas in a hot corn tortilla to eat like a taco. Spread rajas on a fried or baked corn tortilla for an instant (and delicious) tostada. Serve rajas as a side dish to grilled steak, chicken, or pork chops. Chop up some leftover rajas to mix into scrambled eggs or macaroni and cheese. Add Mexican flavor to a hamburger, hot dog, or grilled cheese sandwich with a spoonful of richly flavorful rajas. Add cooked corn kernels to the mix, either fresh, canned, or frozen. Make heartier rajas with the addition of cooked chicken, either shredded or cubed. Add some crumbled white cheese (such as queso fresco). Stir the cheese into the rajas when they finish cooking, or sprinkle some on individual servings.